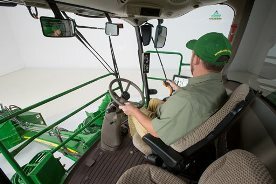 With feet on the ground and eyes on the horizon, our deep customer understanding has guided us into reengineering the well-known 3520 to deliver a distinctive John Deere experience. 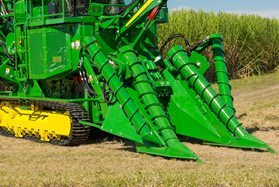 The all-new CH570 cane harvester with its outstanding comfort and advanced cane handling system will provide better returns for your operation by increasing the total tonnage and quality of cane delivered from your field during the whole crop life cycle at a reduced cost. 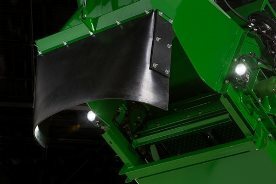 The feedroller path is straight and opens wide to reduce cane breakage and improve feeding to the chopper. Large, deep-paddle lower rollers improve the removal of dirt and mud. 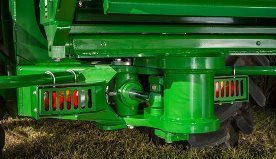 Access for maintenance is better than ever with externally mounted bearings and bolt-on cradle stops with rubber shock-absorber pads. The CH570's reliable cleaning system yields the cleanest cane in the industry. 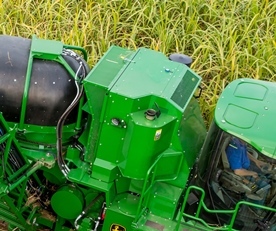 Cleaner cane, less billet loss, and less downtime will bring more profit. The CH570 boasts the largest primary extractor fan in the industry — using four blades that measure a staggering 152 cm (5 ft) in diameter. 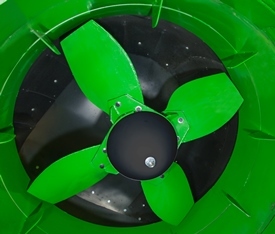 This fan cleans at lower speeds, reducing horsepower consumption and cane losses. The fan speed can be adjusted effortlessly from the cab to adapt to the different cane conditions by simply varying the pump displacement. The fan is driven by a robust and efficient hydrostatic system with piston pump and motor. The fan is mounted directly to the motor shaft, which means no bearings, no blade balancing, less vibration, and fewer components. 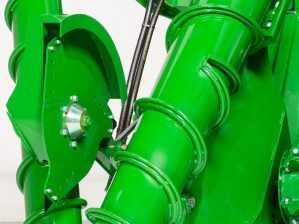 The motor drive support system features four rubber-mounted legs to improve fan stability and reduce vibrations. The primary extractor fan's motor is internally mounted and does not need to be removed for transport. The conical hub cover reduces air voids and recirculation while the wide-design blade produces more airflow at lower rpm. The hard-surfaced blades combined with operating at much lower speed results in significantly longer blade life. 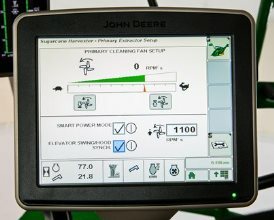 The smart power primary extractor feature is available to automatically reduce the extractor fan speed to a preset minimum when the elevator is turned off. 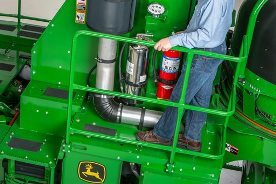 The CH570 features a high-capacity structural tube-frame elevator for extended durability. The elevator's perforated floor allows additional dirt to fall through after primary extraction. 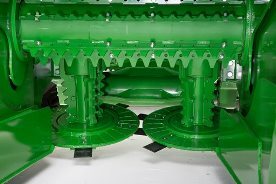 The top and bottom idler sprockets reduce wear and prolong the elevator's chain life. The tall sidewalls and 18-cm (7-in.) reversible slats will handle the heaviest cane, keeping billets from toppling over and falling back down the elevator. All of this sits on the CH570's heavy-duty swing table, designed to withstand the heaviest loads and toughest field conditions. The swing table also features an exclusive slew wiper to keep the area clean. The elevator hoses are routed inside the solid frame, promoting longer life by improving protection and minimizing exposure. 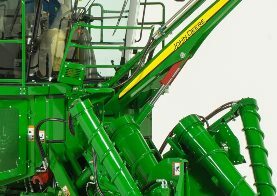 Bolt-on elevator extensions are also available to provide additional reach for wider row spacing. The extensions are 30.5 cm (12 in.) for wheel or track units; and 61 cm or 86 cm (24 in. or 34 in.) for track units only. The 61-cm (24-in.) 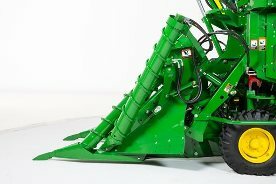 extension can be ordered for a wheel harvesters but it requires the less secondary extractor option. On the CH570, the elevator controls were moved from the floor pedals to the multifunction control lever for ease of operation. The control switches feature a double-detent system so that the elevator swings approximate 90 degrees without having to hold the switch depressed continuously. The above will help the operator to concentrate on other functions when turning around on the headland while the elevator is rotating. 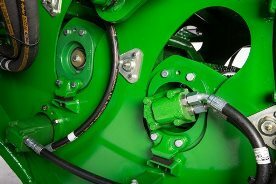 The CH570's elevator also has a grease cylinder for easy elevator chain tension adjustment and a nitrogen accumulator to minimize shock loads. The secondary extractor provides even more cleaning prior to loading. Its unique design allows trash to be blown away from the wagons more efficiently. The hood rotates a full 360 degrees, so it can be set at any angle. 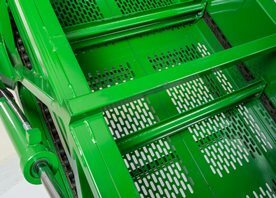 The hydraulically adjustable bin flap directs billets into the wagon. The ideal fan speed allows the best cleaning with low horsepower consumption. For growers who burn cane, a less-secondary-extractor option is available. 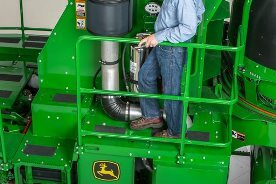 The CH570 Cane Harvester's cooling package features a self-cleaning reversible cooling fan that keeps the cooling package clean. With the new variable speed control system, it will maintain the engine operating at the appropriate temperature to optimize engine performance and reduce fuel consumption. The variable speed is controlled by hydraulic oil, charge air cooler and engine coolant temperatures. The cooling fan reverses automatically every 20 minutes or sooner if the charge air cooler (CAC) temperature reaches a preset value or also as needed on a manual basis. The reversing fan also increases machine reliability and can reduce the expense of replacement parts. 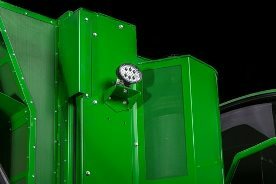 This self-cleaning design eliminates the need for regular stops to remove trash from the cooling system's air-intake surfaces, providing longer operating time throughout the season. Harvester activity monitor (H.A.M.) will monitor harvester activities to improve operations H.A.M. H.A.M. On the H.A.M. screen, identify areas of inefficiencies and take corrective actions that will reduce logistics cost. The H.A.M. accumulates information for: Harvesting time and distance traveled Headland turnaround time and distance traveled Time and distance traveled on the road Harvester idle time while waiting for transport or other Total time that engine is running and distanced traveled Data is accumulated from the original start at the factory and from the last reset done. The information can be downloaded for further analysis using the USB data logging port. 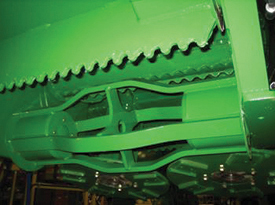 The linkage design improved parallelism of the crop divider base regardless of machine height. 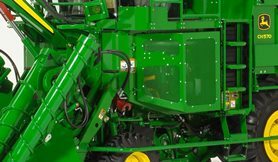 This also enhances the operation of the optional floating crop dividers with less pressure variations and fewer adjustments required. There is significant improvement on the tilt adjustment with better use of the hydraulic cylinder travel for a more precise control. 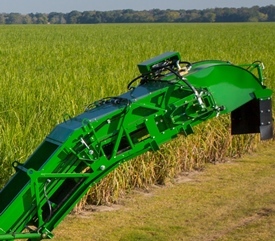 The parallel-linkage crop dividers adapt to ground unevenness for cleaner cane and reduced losses. A wide throat and 45-degree approach angle gently handle even the heaviest cane and consistently maintain the proper orientation to the ground. The benefit is that it reduces dirt content while minimizing whole stalk losses under the crop-divider toe as the row height varies. 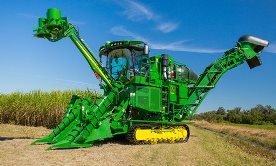 The crop divider scrolls gently lift and feed cane into the harvester throat with a much lower approach angle, avoiding the bulldozing effect seen with other harvesters. 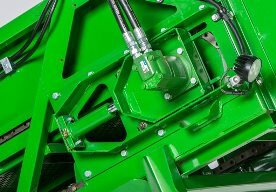 The hydraulic crop dividers and knockdown rollers tilt option turns a 20-minute field adjustment into an instantaneous, on-the-move operation. The toe tilted down lifts the sprawling crop, ensuring all cane is fed into the machine. In standing cane, the toe angled up reduces soil content. 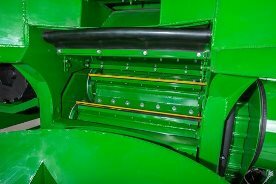 The knockdown roller set in the outer position facilitates feeding heavy-lodged cane. The large adjustable knockdown rollers with deep-tooth paddles effectively feed the heaviest lodged and tangled cane into the base cutter and prevent wrapping of cane leaves and vines. 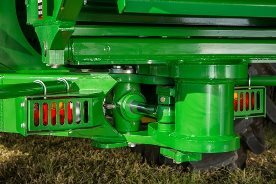 With the innovative hydraulic tilt, the knockdown rollers will align simultaneously so that both maintain contact with the cane, improving feeding and minimizing breakage especially with brittle varieties. Optional floating crop dividers follow the ground profile without plowing while constantly keeping the toe under lodged cane. The benefits are lower soil content, reduced cane loss, and minimum soil disturbance. 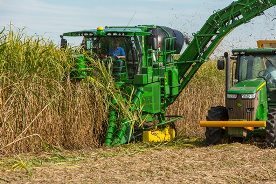 With unmatched 5.2-m (17-ft) topper reach, a strong boom design, and a cushion accumulator, the CH570 is capable of handling the tallest cane. 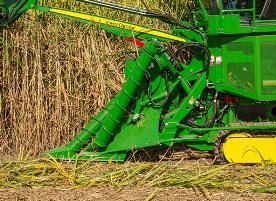 The topper removes the majority of cane leaves prior to harvesting, conserving precious harvesting horsepower and wear edges. 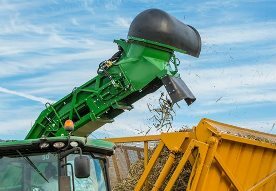 An optional shredder topper facilitates residue management. A piston motor replaced the gear type for higher torque and efficiency. Optional extensions can be added to the standard whole topper to more effectively guide leaves into the topper's blades. It also works well in parts of the world where flowering sugar cane is prevalent. 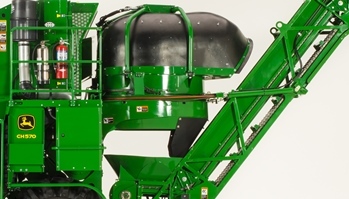 An optional shredder topper is also available for growers interested in residue management. 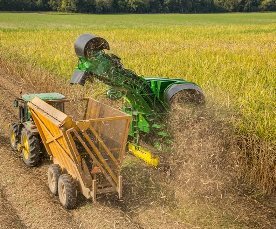 Shredder toppers leave smaller residue particles that dry faster, decompose quicker, and mix into the soil easier when cultivating. These particles will not tangle into other implements like whole-leaf residue often does. This is the same topper used on the CH670 Harvester. Extra width allows better tops gathering for improved cleaning. Ladders and handrails are located on both sides of the machine. This eliminates the need to walk around the machine when the topper, scrolls, or elevator are in use. All steps are high-grip eruption-plate steel for additional footing. Service platforms have non-skid surfacing and are surrounded by handrails for walk-around access. All ladders, platforms, and handrails meet International Organization for Standardization (ISO) standards. The location of the warning and signal meet ISO regulations. Engine compartment work lights illuminate a technician's work area, and 12 operating lights cover the harvester for superior working visibility in low light or foggy conditions. 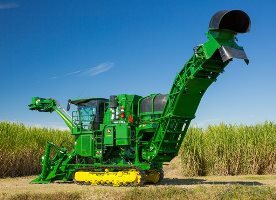 A reverse alarm is also standard on all CH570 Cane Harvesters. The optional beacon light kit includes two lights; one for each folding mirror arm. 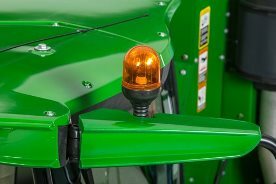 The forward tilting cab lockout is a rigid steel locking prop that holds the cab firmly in the up position so the engine can be serviced. The chassis lift cylinders can be raised and locked in the up position for safe maintenance on basecutter, knockdown rollers, scrolls, etc. The topper boom cylinder can also be locked with a steel lockout sleeve for maintenance on or below the topper head. The CH570 is equipped with onboard water and chemical fire extinguishers. Depending on local regulations, the chemical fire extinguisher cannot be supplied from the factory so in these situations the dealer must provide the appropriate chemical fire extinguisher before delivering the harvester. The premium smart cab is 30 percent more spacious and offers all the necessary comfort, convenience, and intelligent features operators will ever need. Reduced noise levels (76 dB) plus improved air conditioning cooling with overhead vents will keep the operator relaxed during long working hours. Access the cab conveniently from the right or from the left. The wide windshield is curved for enhanced visibility and strength. The left- and right-hand folding arms, adjustable rear view mirrors, and the in-cab convex mirror facilitates viewing the elevator and wagon. The cab comes standard with windshield and side glass wipers with washer fluid nozzles. Eight lights are now used on the cab including four high-luminosity lights that will greatly facilitate night operation. Operators can also help to pass those long shifts with the standard AM/FM radio with auxiliary input. The air suspension seat has multiple adjustments and swivels so you can find the perfect fit and viewing angle. Training is made safer and easier with a training seat standard in every CH570. Adjust the double-tilt telescopic steering column to driving preferences. Road controls are now located on the steering column. 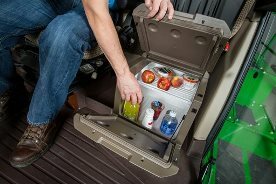 The refrigerator, 37 L (1.3 cu ft) in size, keeps beverages and food items cold, even in a warm environment. The compressor-style refrigerator functions with independent temperature control and is powered from a 12-V receptacle in the rear cab wall that is powered when the ignition switch is in run position. Access to the refrigerator is easy because the instructor seat can either be lifted, exposing the contents in the active refrigerator, or the front door of the refrigerator can be opened, also providing access to the contents. Standard auxiliary lights are halogen type, located on the elevator (2) and the cooling package (2). For optimum brightness on the wagon, add the optional LED auxiliary light kit. User-friendly, and quick to locate, the CommandARM control center is home to every operating feature needed for a simple yet productive day. 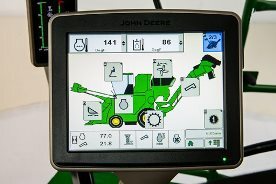 That includes hot keys for all common harvesting adjustments as well as air conditioning, radio, and lighting controls. Navigate through the CommandCenter™ system screens using the navigation control knob located on the CommandARM. 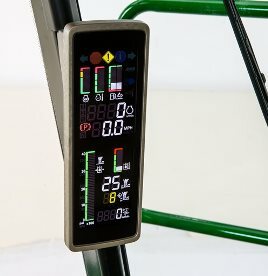 The color-digital cornerpost display graphically illustrates everything an operator needs to know about engine and harvesting parameters. It is located in the optimal line-of-sight to minimize operator disruption. 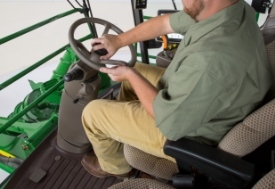 The multifunction control lever fits the operator’s hand comfortably to give smooth hydrostatic speed control. It also controls all frequently used harvesting functions. 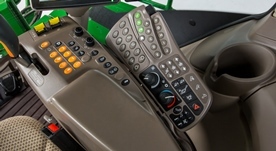 Three programmable buttons are included to customize harvester functions to operator preferences. No longer on the floor, the elevator swing is easily controlled from the multifunction control lever. One extra click and the elevator will swing 90 degrees. The GS3 2630 CommandCenter 25-cm (10-in.) 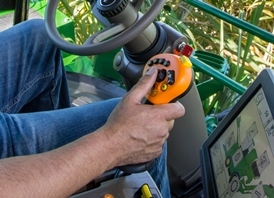 Display puts vital machine and harvesting information within easy reach and with touchscreen technology, it is simple to make quick adjustments. It now provides 70 degrees of swivel for transport or viewing preference. Also, the banner bar has been improved with engine on/ off key. 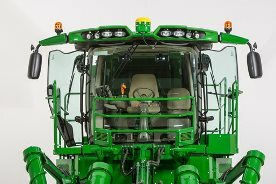 A banner bar will show hours for harvester, engine, elevator, AutoTrac™ assisted steering system, floating crop dividers, and contour base cutter height control. Once the engine is started, it shows engine and harvesting functions. Icons turn green when active. It is video capable and it can run AutoTrac. A feature allows the supervisor or operator (if authorized) to set the hydraulic pressures, and frequency (duration of over pressure), that will activate an alarm alerting of a choke on either the base cutter or the chopper. The display also includes diagnostic trouble codes readings that will alert the operator of a possible malfunction. 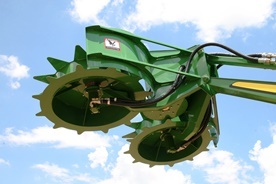 The CH570 crop dividers, side knives, knock down rollers, and floating sidewalls were redesigned for a smooth uniform feed reducing cane losses and soil content. 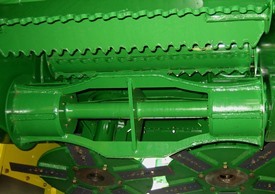 The inside scrolls were angled toward the inside to improve feeding in heavy cane; as a result, the crop-divider knockdown rollers are no longer needed. The outside scrolls are now standard to prepare the operator for different circumstances. The length of the scrolls was increased so the separation of lodged tangled cane begins closer to the ground. Heavy-duty chainless floating sidewall maintains the proper height to reduce cane losses and risk of damage during operation or maneuvering. The geometry of the optional side knives has been restyled for a gentler cut, while allowing cane to flow freely when not in use. 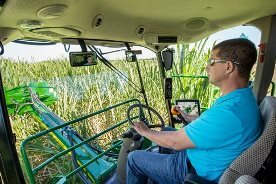 Also, the height is now adjustable to quickly adapt to all possible cane conditions from the cab. The CH570's basecutter and chopper set the benchmark for cutting and feeding in the global market. The standard 251-kW (337-hp) engine option has the basecutter and chopper on one high-pressure hydrostatic circuit driven by a powerful piston pump maximizing efficiency. 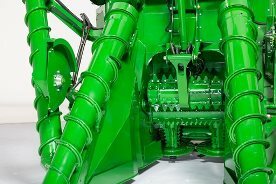 The 280-kW (375-hp) option includes an additional piston pump so that the basecutter and chopper are in two independent circuits, increasing the capacity to process the heaviest cane. 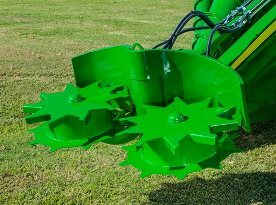 The basecutter is driven by a powerful hydraulic piston motor and has a center-driven design with just four gears to balance the load and reduce wear. The basecutter’s large, standard 61-cm (24-in.) discs can be optioned to 56 cm (22 in.) to allow dirt to flow through in muddier conditions. Contour basecutter height control is a factory option that adjusts the basecutter height to achieve a predetermined cane stubble height. 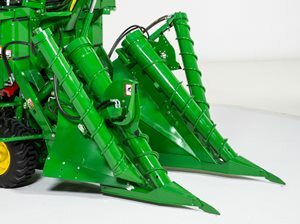 Once cut, the CH570's rotating, three-paddle buttlifter kicks the cane stalks up into the feedroller path and removes excess dirt before it enters. 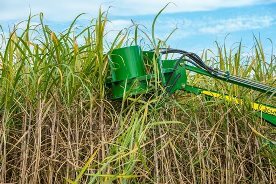 Robust basecutter options meet the vastly different conditions of the worldwide sugar cane market. This option will allow more dirt removal than the current three-paddle open option, and it is structurally stronger than the two-bar option available in the past. 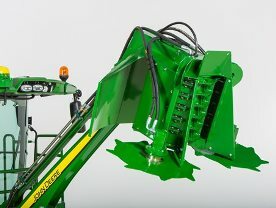 The modular chopper assembly is independent from the harvester’s main frame, providing a better fit and easier service. It sits on rubber mounts to absorb vibrations. The chopping area is larger with longer blades and contact is even through the whole length. Simpler service, longer component life, uniform higher quality billets, and better feeding into the primary cleaning chamber are the results. A powerful hydraulic piston motor drives the 380-mm (15-in.) differential chopper fitted with either six, eight, or 10 95-mm (3.75-in.) blades. The externally mounted bearings are simple to replace. The chopper shafts have no splines to wear, and they can easily slide out from the side for service. The chopper cover is ISO compliant. Eight-blade and 10-blade overlap choppers are also available, increasing the life of the blades in most conditions and simplifying removal and replacement. The blades are 910-mm (35.8-in.) long or 6.3 cm (2.5 in.) longer than previous model. 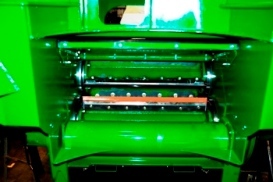 An exclusive sill roller helps to feed the cane billets into the primary extractor. Even billet movement augments cleaning. It also prevents billet back-feeding and accumulation on the sill. 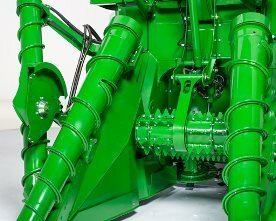 The unique floating crop divider technology was inherited to the CH570 and also enhanced with an updated linkage system. The floating crop dividers follow the ground profile without plowing while constantly keeping the toe under lodged cane. The benefits are lower soil content, reduced cane loss, and minimum soil disturbance. The precision of the exclusive contour basecutter height control is enhanced with the addition of a pressure signal to the existing position input. 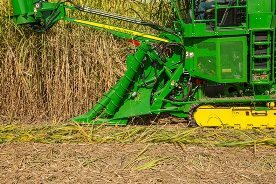 The system ensures that cane is cut at the desired height resulting in higher yield (tons of sugar/ha), cleaner cane, and healthier stubble for improved future crops. 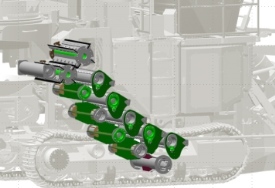 Operators can count on these systems to accurately control the basecutter and crop dividers. 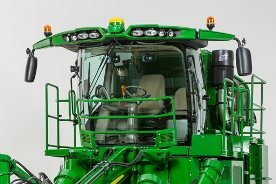 This allows more time to concentrate on other functions such as topping, following the row, and loading. To reduce headland turnaround time, end-of-row and return-to-cut technology is also available. 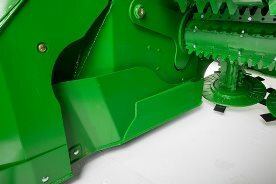 The harvester and crop dividers rise simultaneously with a single button when exiting the field and, upon entering the next row, the unit returns to the predefined cutting height setting. 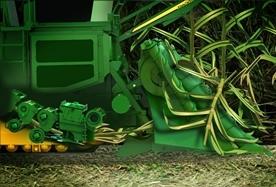 Stress and fatigue are significantly lessened while optimizing harvester performance. 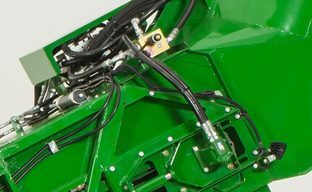 The end-of-row and return-to-cut systems make the harvester operation so simple that the learning curve for inexperienced users is diminished considerably.